Fayerweather Hall began its life as the Fayerweather Laboratory, designed by William Mead '67 of	McKim, Mead & White and built in 1892-94. The chemistry and physics departments shared the building until Moore was built in 1928. As King points out, Frederick Law Olmsted was responsible for the landscape architecture of the building (318-19). 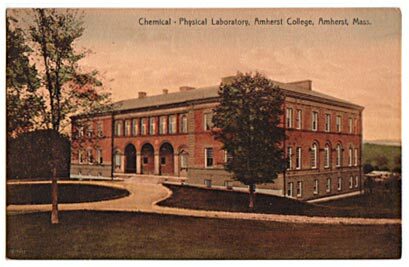 It is named for Daniel Fayerweather, a leather mogul who left money to Amherst in his will. With the construction of Merrill Science Center in the late 1960s, Fayerweather was remodeled to become the home of the Fine Arts and Theater departments. 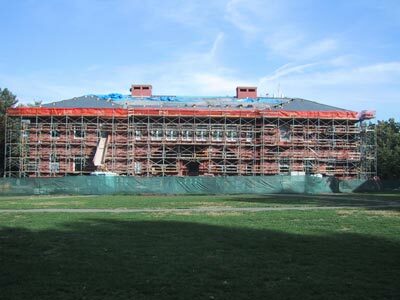 To the left, Fayerweather as it looked October 12, 2001, undergoing exhaustive renovations. Fayerweather is still the home of the Fine Arts Department, but its future wasn't always so sure. In a letter located in the College's Archives and Special Collections dated June, 1984, President Gibbs writes "..after studying several alternatives, and consulting with various groups including students, faculty, and campus planners, the Trustees have concluded that Fayerweather, near the heart of the Amherst campus, is the ideal location for a Campus Center" (A & SC, Buildings and Grounds Collection, box 18, folder 21, page 1). Fayerweather was spared this fate thanks to the urging of the Fine Arts Department, pleased with the space and the light that the building provided. The Campus Center was instead built next door.